For this month's Table for Two, I'll be chatting about The Blue Box Cafe and Alexa is featuring Blank Slate Tea. As soon as I heard that Tiffany's was opening up a cafe inspired by Breakfast at Tiffany's in their flagship store, I knew I had to go. Unfortunately, it would take months before Alexa and I could get a reservation because, of course, everyone wanted to go and they only opened up reservations a month in advance. But luckily, Alexa and I came up with a game plan (or rather she did). She set an alarm for when the next set of reservations would become available and at 9am, we both logged in and I was able to snag one for us! Seriously though, in a matter of minutes times were selling out and sometimes I'd have a reservation in my cart only for it to become unavailable by the confirmation screen. So friends if you want to go, plan ahead. 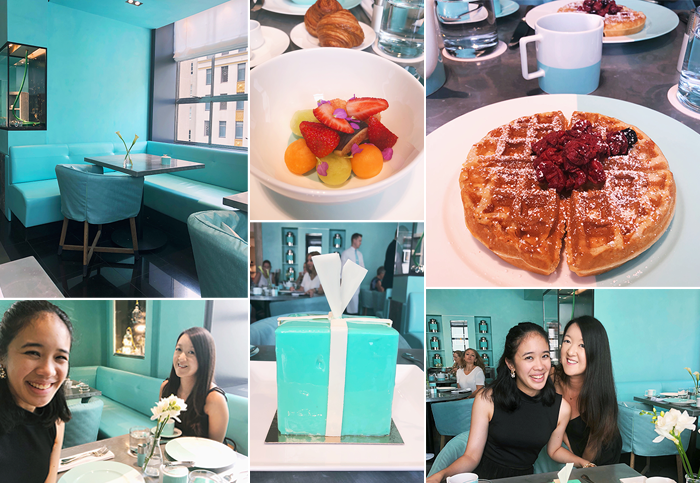 All that being said, it was totally worth it to have the experience of brunching inside Tiffany's. We both wore blank dresses/skirts a la Audrey Hepburn and it was just so fun! I couldn't help feeling a little giddy just seeing the cafe and walking inside. It's an explosion of their signature color, which I loved. The staff was also super nice and clearly used to how excited people are to dine there (basically everyone was taking photos). I will say their menu is very simple but we knew we wanted breakfast which made it really easy for us to order. We got: the Tiffany Blend Tea and Buttermilk Waffle, which came with croissants and fruit. And we topped it all off with the Blue Box Celebration Cake (I'm usually not a fan of chocolate cake but I thought this was pretty good!). If we ever decided to go back, I'd love to go for Tiffany Tea, which seems to be their version of afternoon tea. Dining at The Blue Box Cafe is definitely a must for any fan of the movie! You can find Blue Box Cafe at 727 Fifth Avenue. Let us know if you check it out! Yes! I want to go back for tea too! I also got the waffle when Andrew and I went and it was delicious!